﻿​﻿Widely regarded as one of the best USA sportsbooks since its inception in the 90's. For U.S online sports bettors of the past, Bodog/Bovada may have been the most recognized sportsbook but many would agree that 5Dimes was the best. Thankfully 5Dimes is another site that is capitalising on the bitcoin movement by offering free BTC deposits and withdrawals. 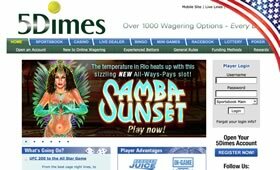 5Dimes is based in Costa Rica and has been in the business since the late 1990s. They are one of the few bookmakers that weathered the storm when the United States tried to crackdown on processing payments to offshore gambling sites. 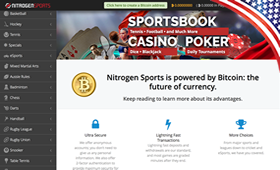 Now with the advent of bitcoin, the headaches associated with funding a sports betting account from the USA are over. 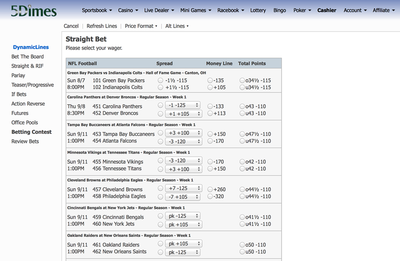 Admittedly, 5Dimes isn't the sexiest sportsbook layout out there. When you log onto the sportsbook you see a list of all the sports with just a check box next to them. No fancy graphics. Not even a cool font. 5Dimes is bare bones but sometimes this can be a good thing. 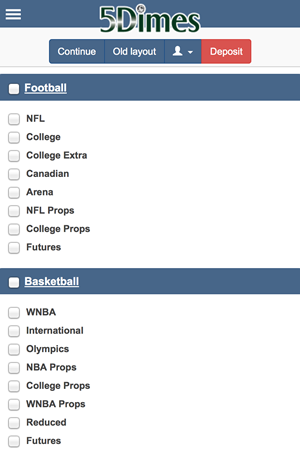 Bettors don't need to be distracted by fancy bells and whistles, we want to know the sports available and that's it. ​While it may not be fancy, the layout of 5Dimes is at least easy to comprehend. All the different betting types are laid out on the left hand side and they're pretty extensive ranging from parlays, teasers, reverse action, futures, and more. 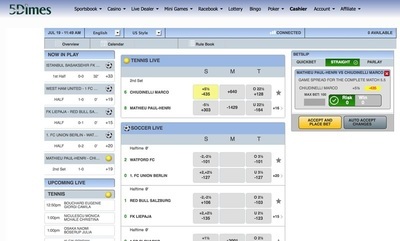 This layout is a “bet the board” style that allows the user to put in multiple wagers quickly and on many different sports. 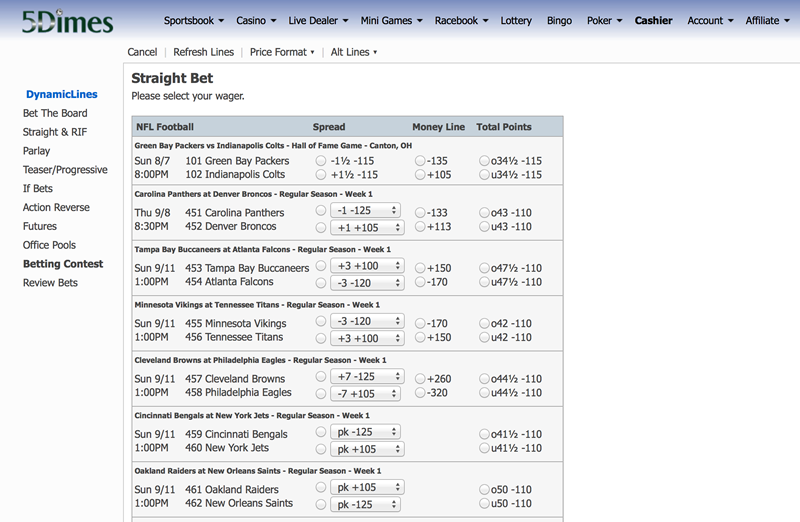 The straight bet layout is a bit more traditional – almost like taking a multiple choice test in high school. Something that 5Dimes prides itself on is offering over 1,000 wagering options every day. This is evident not only in the “types” of bets (progressive, parlays, etc.) but also numerous in-game options across a variety of sports. 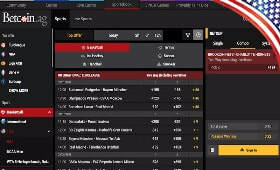 All the big wagering events are there including over 24 different soccer leagues from around the world. 5Dimes is missing some of the popular betting events however, most notably e-sports, darts, and snooker. For what they lack, they do make up for with U.S sports however – providing game props, live betting, and reduced juice lines for all the major American sports. Something interesting to note about 5Dimes is that they are seemingly gearing towards becoming a bitcoin-only gaming site. There's no doubt the processing fees and wait times of traditional financial methods put a dent in their bottom line and create an inconvenience for customers. An idea of how 5Dimes is shifting towards bitcoin exclusivity is their offering of one bitcoin payout every 7 days for up to $5,000 – for people who don't even deposit with bitcoin. Some sites limit you to one withdrawal a month and that's just if you exclusively use bitcoin. For 5Dimes players who exclusively use bitcoin, there are no limits on the amount or frequency of payout requests. Bitcoin deposits fall within a $25 minimum and a $10,000 maximum. 5Dimes does allow you to create multiple $10,000 deposits simultaneously if you really have a lot of loot you want to put into your account. Processing can take up to 40 minutes but there are no transaction fees associated. It should be noted that you do your betting in USD as the bitcoin is automatically converted – but most people prefer that anyway instead of placing a .1106 BTC bet. One of the best things about the simplicity of the 5Dimes layout is that it converts in almost the same manner to the mobile site – in fact it's almost exactly the same. Once you've comfortably navigated the web version, betting from your phone should be a simple task and vice-versa. 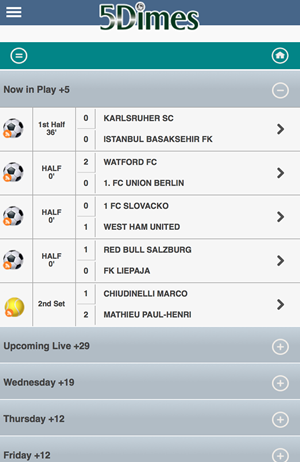 All live betting options are available via mobile and customers can even deposit via bitcoin from their phone. There's really no excuse to not take advantage of a hot line no matter where you are. Mobile gamblers should visit our iPhone & Android Bookie Apps page for other mobile options. For those who aren't familiar with bitcoin betting, 5Dimes has a very helpful live assistance chat box to help get you set up. Some sites take up to 4 hours to respond to your inquiries while others have a “one business day” policy. 5Dimes also has email and phone support for those less pressing issues. For added security, 5Dimes sends you a confirmation email when a bitcoin withdrawal has been requested. You need to click on the link in the email before the payout will be processed. They also enable "Device Base Authentication" that prevents the user of your account on unauthorised devices. One of the best things that 5Dimes does is offer reduced juice betting as part of its rewards and promotions offers. Instead of wagering -110, you're risking -105 to win $100, which is actually a 50% savings. It may not seem like much, but the higher the wager the better your return on investment. What many gamblers will like is that the promotion pays off instantly. At many sportsbooks you have to rollover your deposit 5-10 times before claiming your 50% match – many times the money is gone before you can claim your cash. 5Dimes also offers a new player reward that is eligible for up to $520 in free bets on a $2,000 maximum deposit. This promotion requires a 10X rollover to claim the whole amount but the nice thing is that they release the bonus in 10% increments at each rollover. For many U.S players, 5Dimes was the premier book of the past. 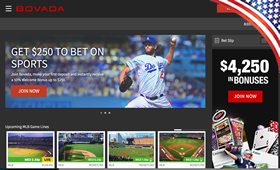 With their shift in direction to becoming a more bitcoin-friendly, and in fact almost a bitcoin-exclusive online betting site, 5Dimes looks like it could also be one of the great sportsbook of the future. .